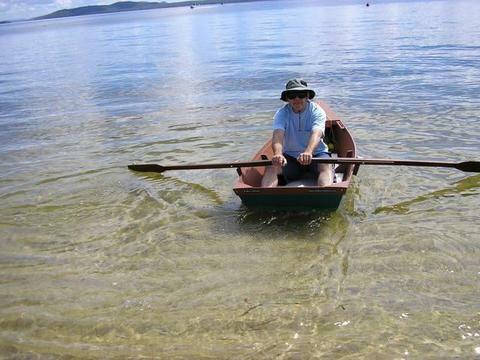 Tardus was a bit too heavy and cumbersome to car-top single-handed, so I thought I'd try a one-sheet skiff, light enough to take on holidays. Update: put up for sale on eBay! "Put it up on eBay!" Here are some pictures of it, repainted for sale. 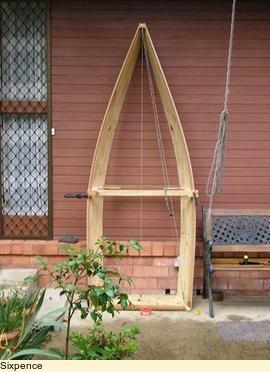 I added about 45mm freeboard by using thin dressed hardwood for the gunwales. Other than that it is about standard. 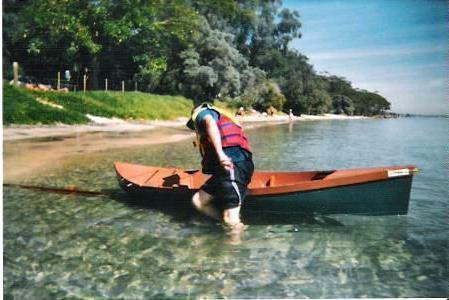 I used the same 7mm CD ply as on Tardus and the boat comes out at about 18Kg (40 pounds) ready to row. I pretty well followed David Beede's instructions, for the external chine log version. I dislike messing with fibreglass and fillers, and still had enough silicon bronze ring-nails left over from building "Tardus". 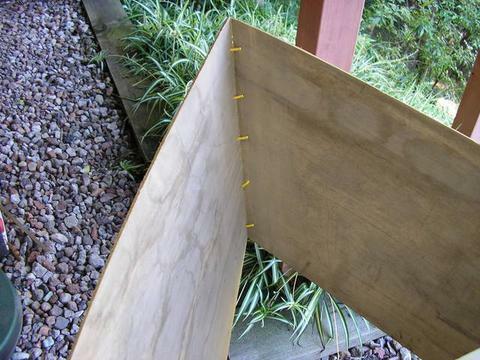 Here is a photo of the sides, transom and middle frame, standing up against the wall. Notice the turn-buckle and wire to pull it into some semblance of symmetry. Despite my best efforts the stem came out a little twisted, which gave me the idea for the boat's name "Sixpence", from the old nursery rhyme about a crooked sixpence. I decided to make the chine logs a bit thicker, which was not a good idea. While I was pulling the two sides together using a strap and ratchet there was a resounding crack (two actually) as the chines split. Here's the result. Fortunately I was able to recover. 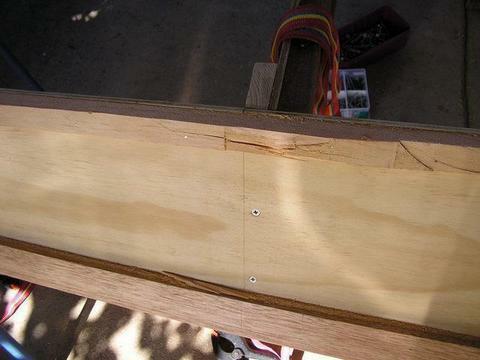 I let the sides straighten out, forced white glue into the cracks and clamped them hard. Once dry, I sawed the logs down in thickness using my portable circular saw, then planed them smooth, bronze nails and all. The thinner chines bent well this time and I was able to finish of the hull. Sixpence-halfpenny came along for our holiday at Port Stephens, about 200km north of Sydney. 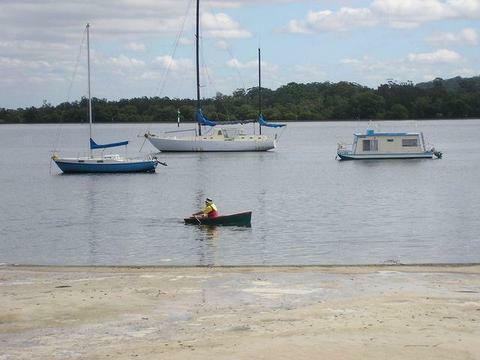 My wife and I rented a gorgeous duplex house very close to Dutchies Beach on the clear waters of the Port. Actually, it was never successful as a port, being too shallow, but is a beautiful and popular holiday spot. Clear waters, resident dolphins, beautiful beaches, surf if that's what you want or quiet swimming beaches like Dutchies; more our style. 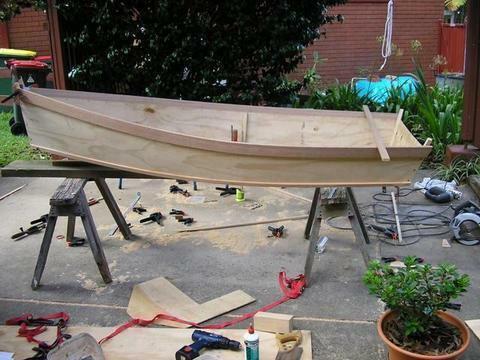 Here's the boat complete on its trolley, ready for a walk to the beach (200 metres). The trolley is two junk/cracked alloy 20" BMX wheels attached to a piece of timber, and held on with a simple bit of cord and a truckies' hitch knot. Here's a couple of shots rowing at Dutchies. With the pointed tail it definitely is easier to row and carries further between strokes than the original Mini-Sharpie design. 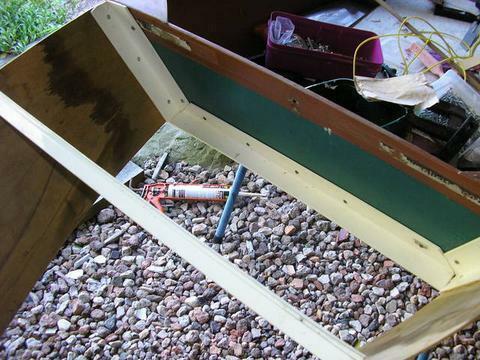 Directional stability was not wonderful; probably needs the skeg moved further back (I left it attached just in front of the original transom). Next trip out at Dutchies was a lovely clear day with a light northeaster blowing diagonally back towards the north facing beach. Just the day to try out the sailing rig. This is David Beede's 33 sq. ft standing lug rig made to the instructions on his web site, including yellow polytarp, green plastic coated garden stake for the yard and PVC conduit clips to hold it together. 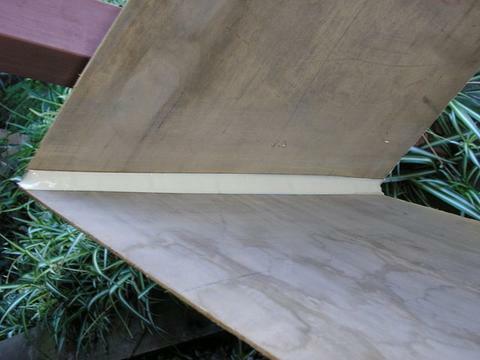 The lee-board was the dagger-board from on old junked windsurfer, and the rudder cobbled-up from scrap ply, timber, aluminium strapping and a 1" PVC pipe tiller. 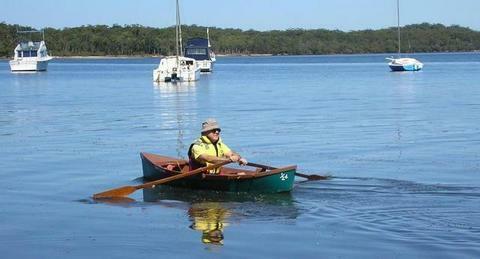 Sadly, the maiden sailing voyage did not go well. In hindsight I think the lee-board was too far back, resulting in lee-helm. That and a smallish rudder meant I could not get it to tack at all. 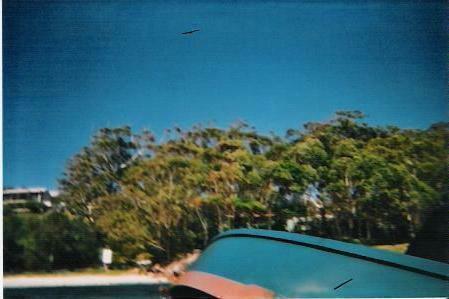 Every time I eased off the sheet and rudder I was pushed further down the beach towards a little rocky headland. With the limited stability of the narrow hull, and my limited agility in moving my weight quickly and accurately, the boat would ship a little more water each time. Eventually there was enough water aboard to upset stability entirely and boat and I did a graceful slow-motion capsize, oddly enough to windward. 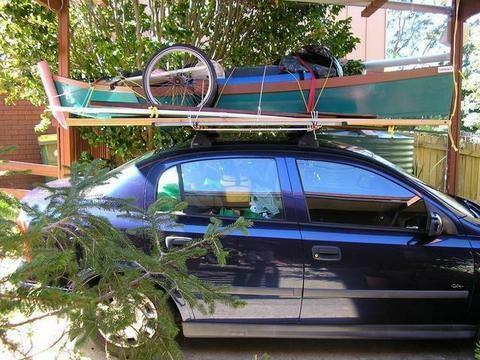 I guess this is yet another case of dont-fiddle-with-the-design-until-you-have-some-experience-sailing! 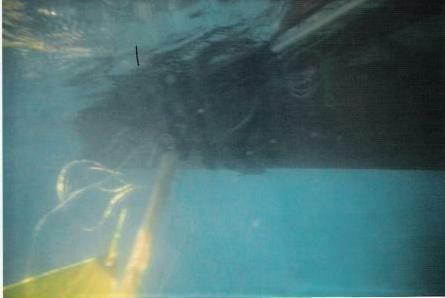 I had a disposable underwater camera with me, so here is a shot of the upturned hull - I am of course on the other end of the camera. I tried to swim the boat to the beach but progress was nil. By the time I thought of releasing the sail to reduce the drag I was already passed the sand and opposite the rocks. My poor wife, who could no longer see me (I was on the far side of the boat, in the water), got down the beach as fast as she could. One of the locals asked her if I could swim well, to which she answered "He's English". "We'd best go and help him then!". I wasn't really in danger, what with a good life-jacket, a buoyant wooden boat, about 100 metres offshore and a gentle breeze blowing along the beach, but it does get a bit lonely out there, and I was glad to see the two of them arrive with flippers and goggles. By this time we were past the point and off the next beach. With the mast out we righted the hull, still full of water, and soon had it into the beach. No damage except to my reputation and confidence, and to my dear wife's emotions. However, after due thought, I suggested the boat would make a nice storage cabinet for her wool and other craft materials. She agreed! 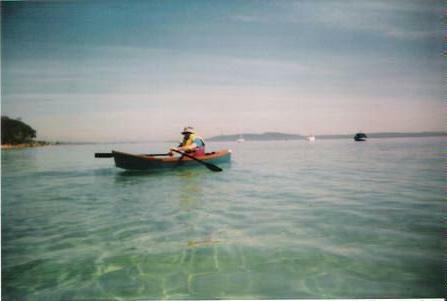 We agreed on one last rowing outing, at the very quiet Taylor's beach nearby, a few days later. 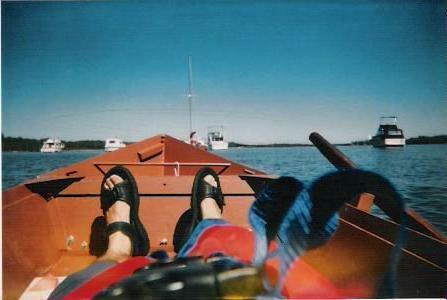 We got some good photos, and I enjoyed the rowing. Home Again! Here it is on top of our car, waiting to be unloaded. I may get a photo in later of Sixpence in its retirement as a cabinet. 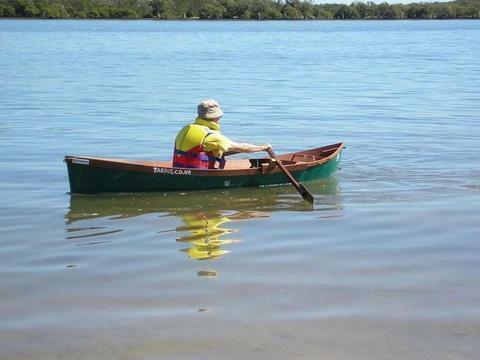 I am very interested in the "Origami" folding dinghy from http://www.woodenwidget.com. 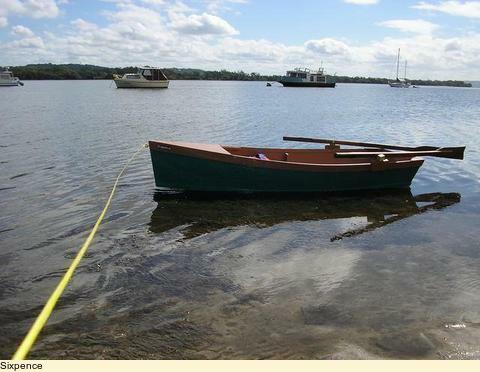 Very light, sea-worthy and has a sailing rig too, and I could use my 2HP outboard on it too. 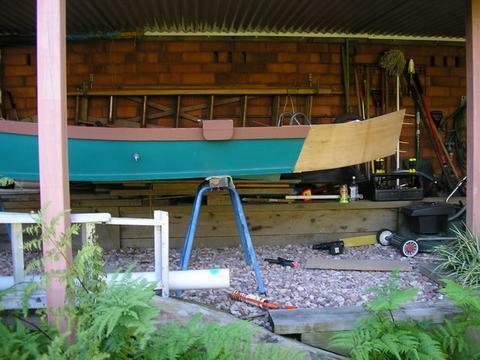 Further thoughts - Sixpence is too big for a bookcase or storage cabinet in the house, and we already have a boatcase I built earlier (slightly reduced One Sheet Skiff to Herb McLeod's design). 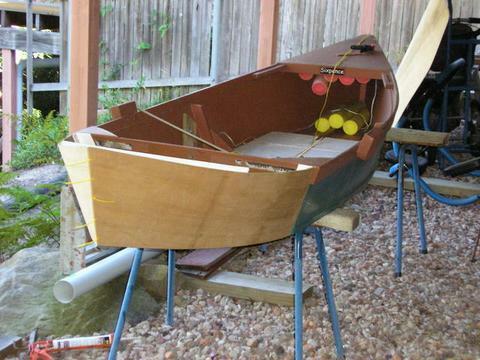 I'm thinking that some extended gunwales for extra freeboard, boxing in the tail as a flotation chamber, and ditto the foredeck, a bigger rudder and a smaller sail might yet turn it into a success. Sure looks pretty when out rowing, and it seems a shame to waste it. 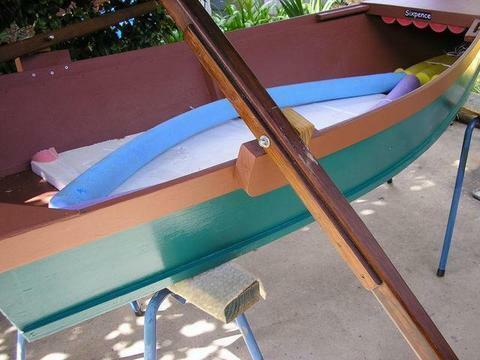 May 2012 - cleaned and repainted, and replaced the "oarlock" outrigger blocks, so that it could go on eBay. I was going to toss it out, but a friend said "put it on eBay, someone will buy it!". Since I have had several bids, and still 3 days to go, looks like he's right. The proceeds (inc. whatever else I can sell on eBay) should go nicely towards an electric assist for my tricycle project. Here are some shots after the repaint. 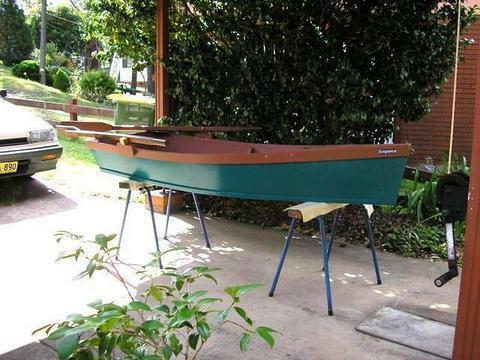 Notice the "workboat" finish, using outdoor premium acrylic housepaint that I had lying around. This stuff is very durable, and a lot of amateur boat builders use it now for its durability, relatively low cost and ease of application.